It’s official, Ronda Rousey will challenge Nia Jax for the Raw Women’s Championship. This match was announced at the NBC Upfronts. For those who do not know, In the TV business, an upfront is a gathering at the start of important advertising sales periods, held by television network executives and attended by major advertisers and the media. It is important to note that May is a sweeps months. This is where networks love to put their best product forward. It is important to remember that WWE is a television show. Part of the reason the Super Bowl was moved to February was due to the fact that it is a sweeps month. The build-up to Money in the Bank will happen through the majority of May. Let's not forget they are competing with the NBA and NHL right now as well. 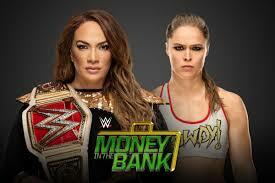 This means we will See a lot of Ronda Rousey on WWE television. I do not expect Nia Jax to win the title, but I believe it is great that she’s in the title match. This also means that a lot of the other girls are in the ladder match. Do we want another match like Naomi vs Lana at last year’s Money in the Bank? Nope. Be sure to subscribe to Break It Down With Brian H.